Read the Forum Conclusions in full! Europe’s rural regions face a triple threat: how to adapt to climate change, protect biodiversity, and still provide for human needs—in rural, as well as resource-dependent urban areas. 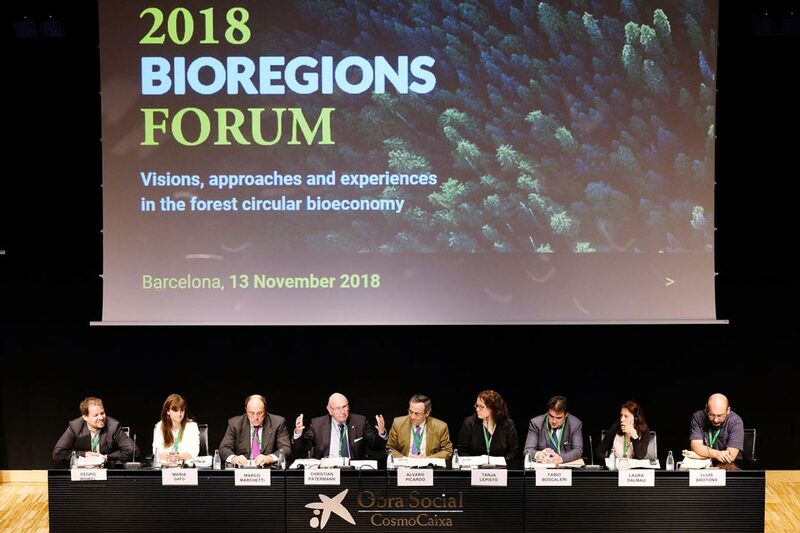 For the participants of the 2018 Bioregions Forum, hosted by CTFC and EFI in Barcelona, the solution lies within the potential of regional adaptations of bioeconomy systems. The concept of bio-based economy has generated significant buzz following the new Bioeconomy Strategy promoted by the European Commission. The idea of an economic system that mimics biological and ecological cycles is extremely relevant to rural Europe’s triple threat; a means of elevating innovations that link human life, business, and nature to optimise value and minimise waste. Through a series of panels and presentations from experts in the public and private sector that highlighted both future opportunities and successful case studies, the Bioregions Forum emphasised the importance of turning words into action at a regional level. The setting of the Forum was apt: attendees from Europe’s forest, agriculture, and fishing sectors gathered against a forested backdrop, the Amazonian botanical gardens in the Cosmo Caixa museum in Barcelona. Keynote speaker Waldemar Kütt, the head of DG Research and Innovation in the European Commission, called attention to the diverse range of attendees, “it’s time to take advantage of the strengths of different sectors.” Felipe Ortega, Deputy Advisor of Agribusiness and Rural Development for the European Investment Bank (EIB), reinforced this point in his Keynote speech, highlighting the EIB’s priority to encourage and facilitate participation in bioeconomy development. In the first session of the day, Andreu Mas-Colell, Professor of Economics at Pompeu Fabra University, helped elevate three real-life examples of the bioeconomy in progress. Presentations immersed attendees in groundbreaking action: from the sustainable timber structures brought to life by Višnja Košćak of Wood Cluster Styria region; to a dynamic exploration of the seemingly boundless possibilities of cork (including in space!) by Francisco Carvalho of the Amorim Group; and, finally, to a detailed view into Metsä Group’s core bio-based business model, as Jari Voutilainen explained some of the company’s newest innovations. Following these inspiring examples of the bioeconomy in practice, the Forum’s second session convened policymakers and regional leaders from across Europe to discuss ways to foster successful local implementation, chaired by Christian Patermann, from the Bioeconomy Council of the German Government. María Gafo from DG Agriculture and Rural Development and Marcho Machetti from the University of Molise stressed the need for alliances and cooperation among regions to help bring trans-European strategies to a regional – even a hyper-local level. Juxtaposed with the image of wild Amazonian gardens, Machetti characterised Europe poignantly as “the continent with the lowest coverage of pristine forest, and a high variability of cultural landscapes.” A panel of local leaders from Germany, Castile and Leon, Finnish Lapland, Tuscany, and Catalonia spoke to the need for collaboration with universities, infrastructure for pilot projects, and funding mechanisms to bring an enhanced regional focus to the bioeconomy. In the third session, Lauri Hetemäki, Assistant Director of EFI joined Edgar Nebot from GRAF-Bombers, the Catalonian group of forest firefighters, to give Keynote speeches about the future of the European circular bioeconomy. In addition to echoing the need for collaboration and funding raised in earlier sessions, the speakers presented another fruitful area for future development: the valorisation of intangible forest services. Better understanding the value of local resources through payment for ecosystem services (PES) schemes could provide landowners with the incentive and means to maintain sustainable development and bioeconomy initiatives over time. The final panel of the day looked forward to define the regional bioeconomy’s next steps – including the creation of a forum for regional thinkers and decision-makers to coordinate and exchange knowledge about bioeconomy approaches and innovations. Concluding thoughts were led by Bittor Oroz, from the Basque government, Donatella Spano, from Sardinia, and Teresa Jordá, from Catalonia. As attendees filing out of the room discussed the day’s revelations and made new connections with innovators from different sectors, Christian Pattermann’s urging that “ideas from this meeting need to leave this room” began to take form.